Every company nowadays want to do ‘something’ with cloud services. For this POC I had one use case proving we could deploy workloads to vCloud Air just like you would deploying the to the local vSphere infrastructure. 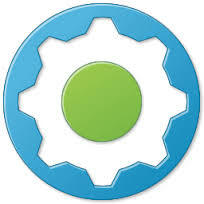 vCloud Air is available as a subscription service and OnDemand, providing more purchasing options. 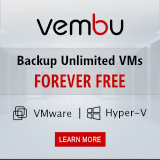 With vCloud Air OnDemand, you have instant access to infrastructure that can be managed by the same group that administers your on-premises vSphere environment. With this service, you are only billed for the resources you use on a per-minute basis, and pay only for the resources you consume. With vCloud Air subscription offering, you get a predictable monthly bill and ability to purchase cloud with a purchase order. vRealize Automation is at its best when you position it as a Cloud Management Platform (CMP) leveraging multiple infrastructures to deliver a hybrid cloud infrastructure. The combination of both vRealize Automation and vCloud Air lends you tools to become more agile and enable various use cases that are not found in the traditional data center. 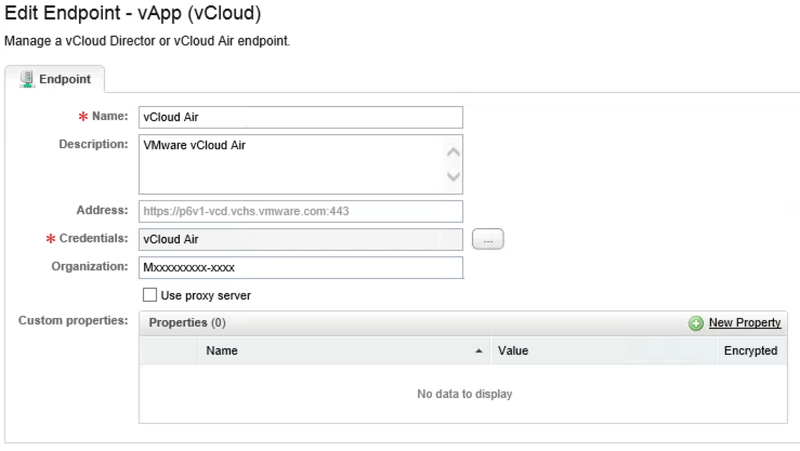 To start, we need to have a vCloud Air account which will enable you to setup a VDC and will have some catalogs that you can build virtual machines from. Account Administrator rights on vCloud Air. Next, log in to vCloud Air and go to your Virtual Data Center Details and select Cloud Provider Access from the menu on the right side (click image for enlargement). 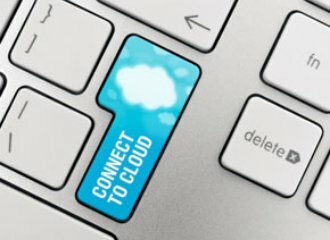 Write down the details provided, you need these to connect vRealize Automation to vCloud Air. In my case the address is: http://p6v1-vcd.vchs.vmware.com:433 and the Organization Name: Mxxxxxxxxx-xxxx. NOTE: Because I encountered some problems with my Internet connection, it looked like my setting where wrong. Researching the settings to use I encountered numerous documents incorrectly stating you need to add ‘/org’ or ‘/api/compute’. To utilize resources in vRealize Automation like vSphere, or in our case vCloud Air, you will need to configure an endpoint in vRealize Automation. 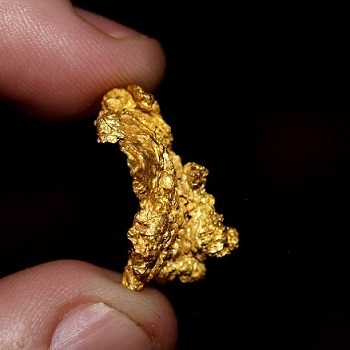 An endpoint is a connection for the management of that particular resource. It defines; What type of service the resource is (Cloud, Physical, Storage, Virtual), where it is located (by URL, IP), and the credentials for accessing that resource. 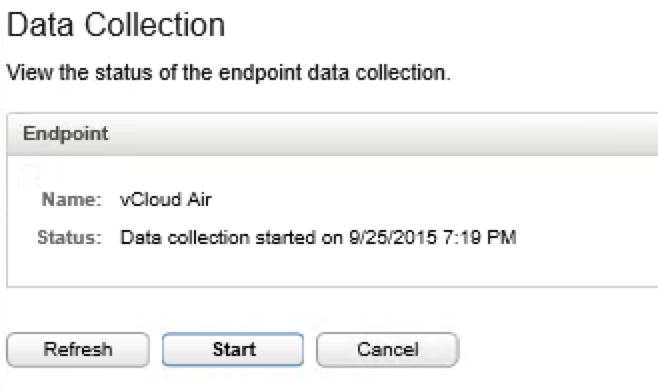 To configure a vCloud Air endpoint, login to the vRealize Automation Console and navigate to the Infrastructure Tab. From there, you will want to select the Endpoints tab from the left-hand menu. On the right top select ‘New Endpoint’ and ‘Cloud’ and ‘vApp (vCloud)’. Give the new Endpoint a name a description and provide the credentials you used in step 1 and the Address and Organisation Name you wrote down. Name – This is a tag, used for you to identify the connection. Address – This is the actual OnDemand API URL for your environment. The format will be ‘https://region-name.vchs.vmware.com/api/compute’. It has the ability to create small console-only accounts on behalf of your users, so they can access a console of their provisioned machines. Organization – The Organization is a unique ID, used to identify your specific environment in your OnDemand region. When done your Endpoints should look something like this. Once the endpoints have been created, you will to perform a Data Collection to discover the new Cloud Air instance and its content. Since Data Collection requires a good cloud connection with valid credentials, it is a great way to check the health of your new endpoints. 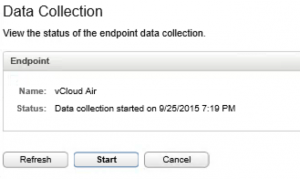 To perform the data collection, hover over the vCloud Air endpoint you just configured and select the ‘Data Collection’ option. Select ‘Start‘ and you will see a Data Collection is requested. The first Data Collection may take a while to complete. Finally you should receive a message stating that ‘ Endpoint Data Collection succeeded‘. We’re almost done but the last step to take is creating a reservation(s). Go to ‘Infrastructure’, select ‘Reservations’ and again ‘Reservations’. Now add a new reservation by selecting ‘new Reservation‘ and ‘vApp (vCloud)‘. You’ll need to select the compute resource, a name for the reservation, the tenant to assign it to and a business group. You’ll also need to add a priority to this reservation in order for blueprints to decide which reservation to use first if multiple reservations exist. On the resource tab you need to reserve an amount of memory and storage. And on the Network tab, select the network you want to use to connect the virtual machines to. Now you’re good to go and start making Blueprints to deploy to vCloud Air, but I will handle that in another article in the series.